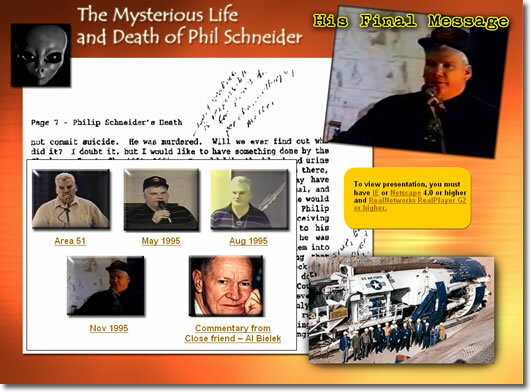 Phil Schneider, a very brave man, lost his life due to what appeared to be a military-style execution in January 1996. He was found dead in his apartment with piano wire still wrapped around his neck. According to some sources, he was brutally tortured before being killed. Phil Schneider was an ex-government engineer who was involved in building underground bases. He had a Rhyolite security clearance - the highest every to come out and tell it like it is. His work as a geologist for the government took him to over 70 countries and put him direct contact with the Alien Greys. Phil's connection to the Philadelphia experiment comes through his father Oscar. Oscar Schneider was the medical officer for the Philadelphia Experiment and kept that secret with him until he was close to death. Before he died, Oscar told Phil the true story of his past and gave him photographs to back up his claims. The Real Player G2 or higher is required to play these media files. Visit the Tools section for more info. Map of Groom Lake - Where Phil once worked. Pictures of Black Military Projects he worked on. More photographic evidence of saucers at Bikini. Geological evidence of Atomic Explosions thousands of years ago. Copy of security clearance at Area 51. Notes of location of underground bases. Materials from Alien Spacecraft and Stealth Fighters. More photos of secret projects. Phil shows his scars from the Dulce wars with the Greys. In addition to having his chest opened up by a Grey, Phil lost three fingers. 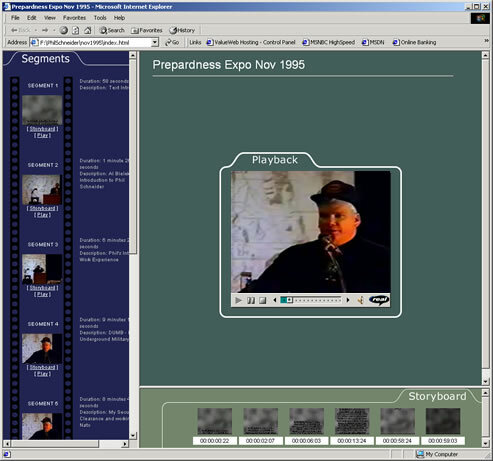 We put together one computer CD that has all the remaining videos (six hours) of Phil's presentations in 1995. Some of the information is redundant, but you'll have access to his final repository of information. Please note, the content plays best in Microsoft Internet Explorer 5.0 or above. We included the one hour video from Ted Gunderson - "The Story of the Art Bell Lawsuit" given at the Global Sciences Conference in Denver on February 2001. 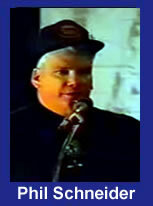 Ted Gunderson was named by Art Bell as one of the reasons he went off the air. Art Bell brought suite against Ted Gunderson for "supposed" remarks Ted made on the air accusing Art Bell as a child molester. Ted was in the FBI for over 27 years and became a successful Talk Show host shortly after retirement - perhaps too successful. You've heard Art Bell's side of the story, now hear Ted's side. Follow the true facts of the case step-by-step and see actual court documents. You'll be shocked when you hear "the rest of the story".